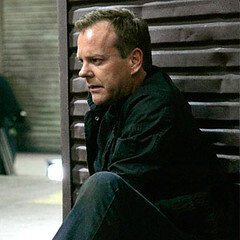 The four hour premiere of “24: Season 8” begins tonight. Two hours Sunday, and again on Monday. There’s a lot of information at KeiferSutherland24.net. Joining the cast: Katee Sackhoff, Freddie Prinze Jr., Mykelti Williamson, John Boyd, Jennifer Westfeldt and Chris Diamantopoulos. Season Eight begins in Manhattan. CTU has been upgraded and is run by BRIAN HASTINGS. Freddie Prinze Jr. plays COLE ORTIZ, an ex-Marine who wants to follow in JACK BAUER’s footsteps. He runs the division’s Field Operations. ROB WEISS is PRESIDENT ALLISON TAYLOR’s new chief of staff, and MEREDITH REED is an ambitious journalist with ties to the unfolding situation. Keifer Sutherland, Cherry Jones, Mary Lynn Rajskub and Annie Wersching return. And Bollywood actor Anil Kapoor (“Slumdog Millionaire”) makes his American TV debut as OMAR HASSAN, a Middle Eastern leader who comes to the U.S. on a peacemaking mission. I won’t be watching the finale of “24” until after The Bachelorette.” But I’m already thinking about it. I’ll update after I’ve watched it. Update: The finale was great. I think one of the things I like best about the show is how un-Hollywood in appearance so many of the characters are. The casting is just great.